We’re turning this mess of a space into a modern farmhouse bathroom over the next 6 weeks for One Room Challenge. Today, you’ll see the bathroom renovation pictures of the “before” for this big renovation project! Come along with us for this wild ride of a journey! Guys….we did something crazy. Like completely and utterly insane. It has been something that has always been on my blogging bucket list and it is sorta kinda considered a “rite of passage” for DIY/home bloggers. 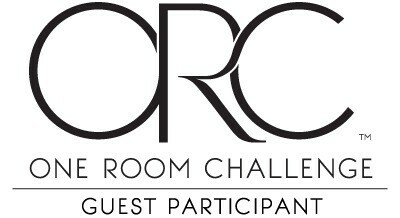 We signed up to participate in One Room Challenge for the first time ever! 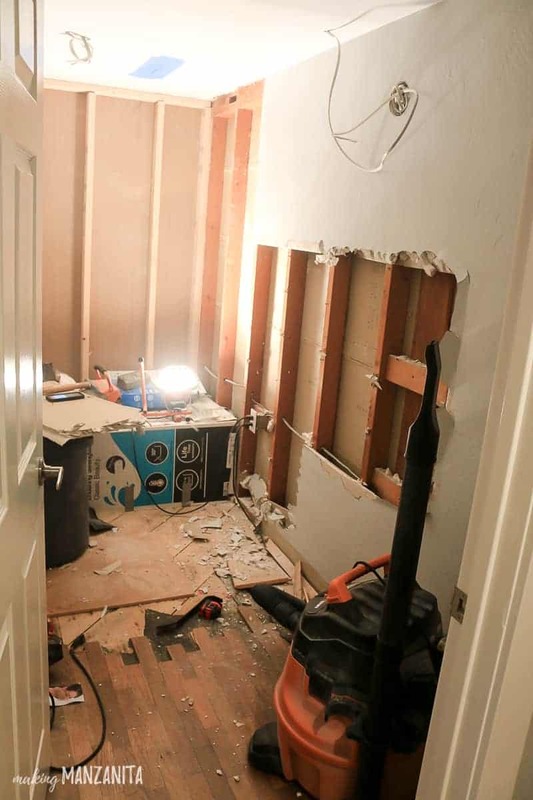 One Room Challenge Week 1: Bathroom Renovation Pictures (Before) – you are here! 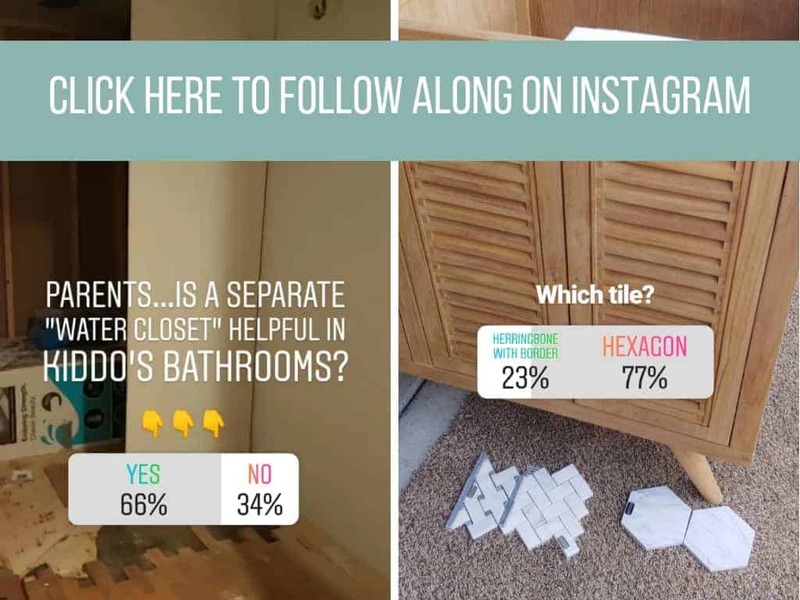 This bathroom renovation pictures contains affiliate links, but nothing that I wouldn’t wholeheartedly recommend anyway! Read my full disclosure here. What is One Room Challenge? I’ve followed along with One Room Challenge and always wanted to participate, but the timing was never right. Fast forward and the other renovations we have going on (like the nursery) haven taken a lot longer than expected and getting things done with a baby and a toddler hasn’t been the easiest. 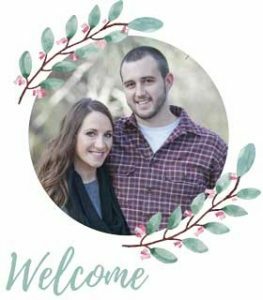 Heaven forbid, I haven’t even shared the final reveal of the nursery yet!! 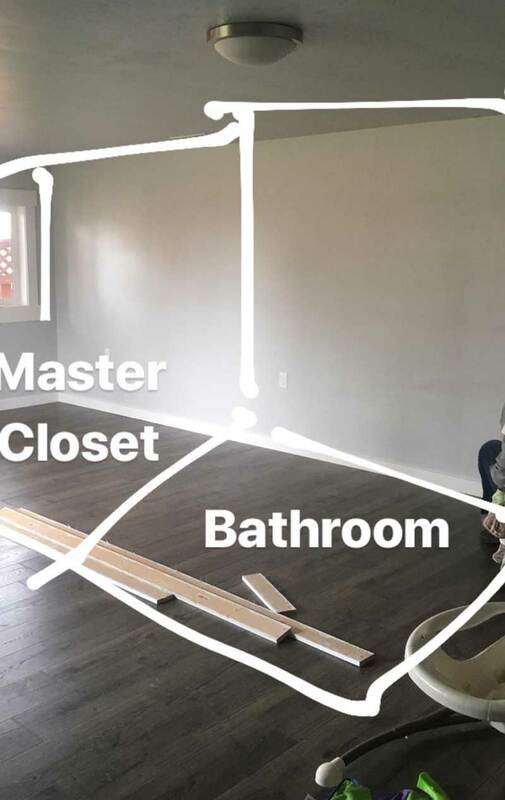 Months ago when I knew that Fall One Room Challenge was coming up, I told Logan about it and we decided that the bathroom we’re creating for our kids would be good timing and so we committed right then and there to just do it. But, this modern farmhouse bathroom is not a simple makeover where you paint walls and vanity, swap out light fixtures and hand towels and call it a day. Nope, no way, no can do. This modern farmhouse bathroom walls literally didn’t exist when we moved into this home earlier this year. We are literally turning nothing into something…and hopefully it will be something beautiful. I tell you all of this so you can empathize with me when I tell you that the next several weeks are going to be insane, but fingers crossed we’ll walk away with a brand new modern farmhouse bathroom and we’ll take the holiday months to do some serious relaxing. 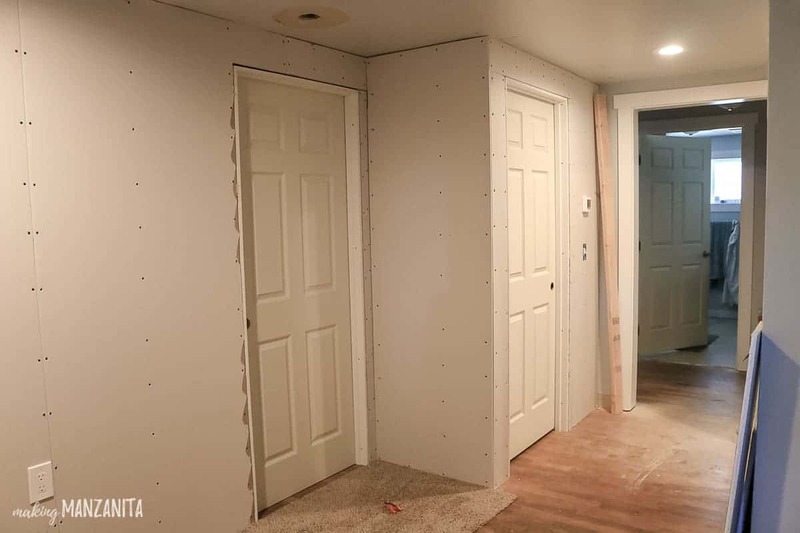 No big renos planned for at least a couple months, but who knows… Knowing us, we’ll probably get bored/get cabin fever from the cold weather and start something. It tends to happen every year. 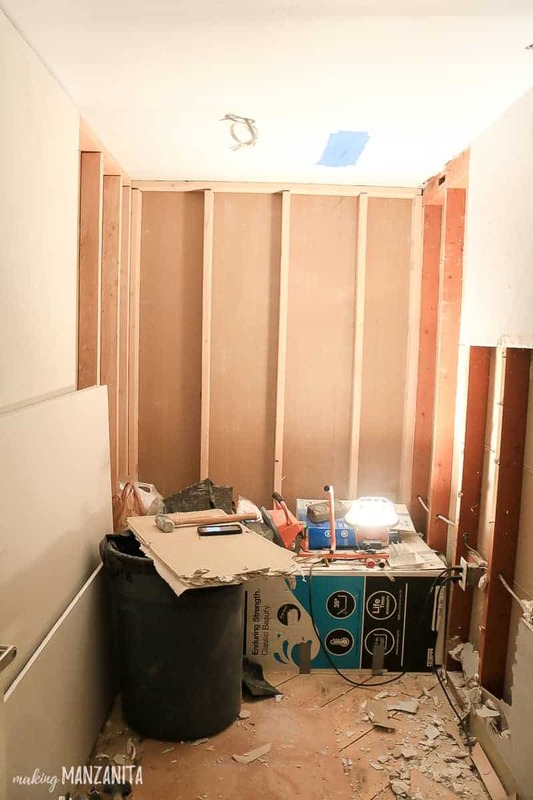 Today I’m going to show you the brutal bathroom renovation pictures of the “before” & show you what we’ve done so far! So, are you ready guys? 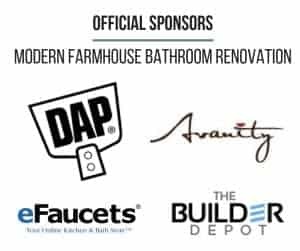 …Ready to come along for a wild ride as we create this modern farmhouse bathroom? Ok, I know what you’re thinking…. this isn’t a bathroom. 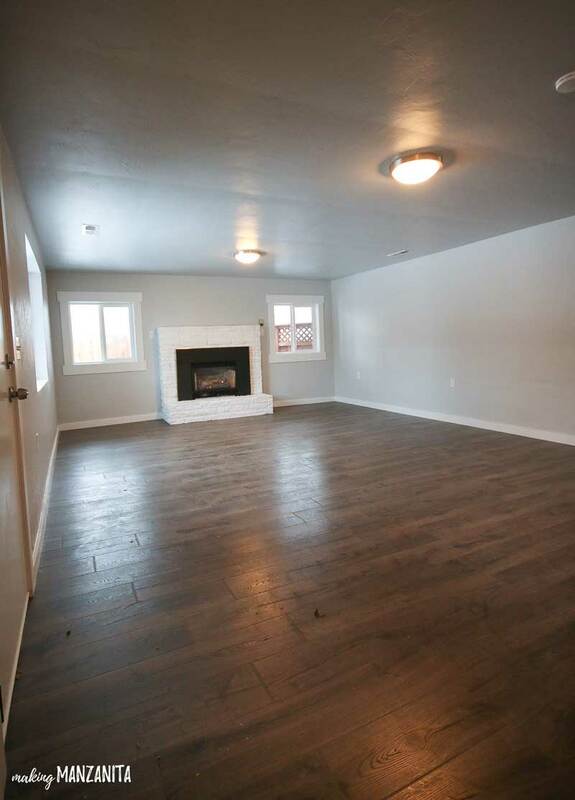 This is a living room… SIKE! Well, in the last several months we have completely and utterly transformed this 2nd living room into a nursery, master closet and bathroom. But for this project that we’re tackling for One Room Challenge, we’re just focusing on a corner of this room…. 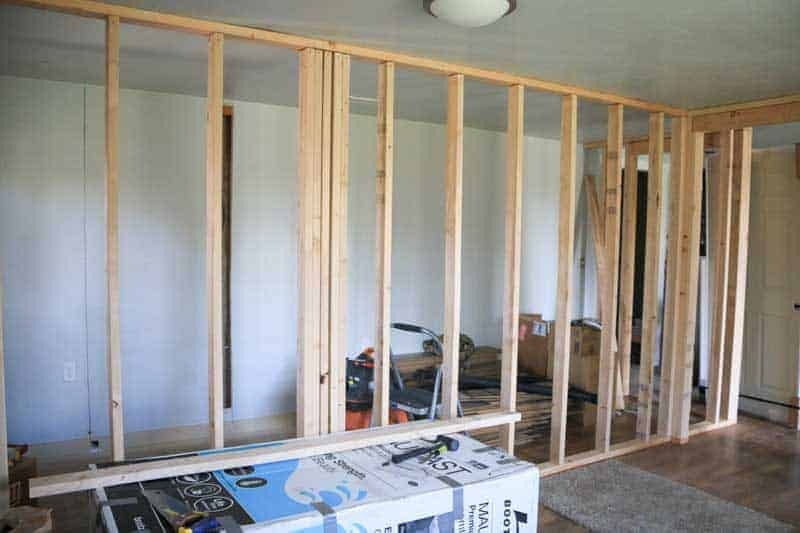 Now when we built the walls for the nursery, we also put up the walls for the bathroom. Further Reading – Learn how to build a wall in this article! Here’s the same angle after the walls got put up. 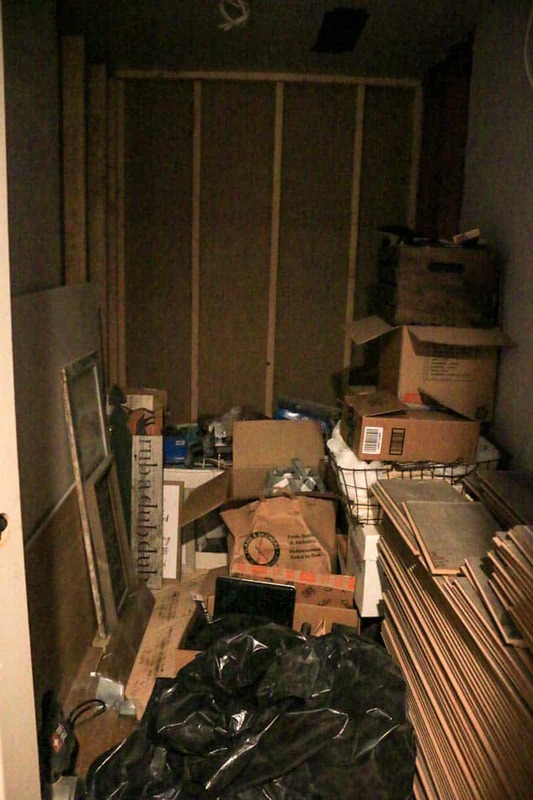 You see where that laminate flooring, boxes and shop vac are sitting….well that’s the bathroom. Well, at least that’s what it looked like a few months ago. 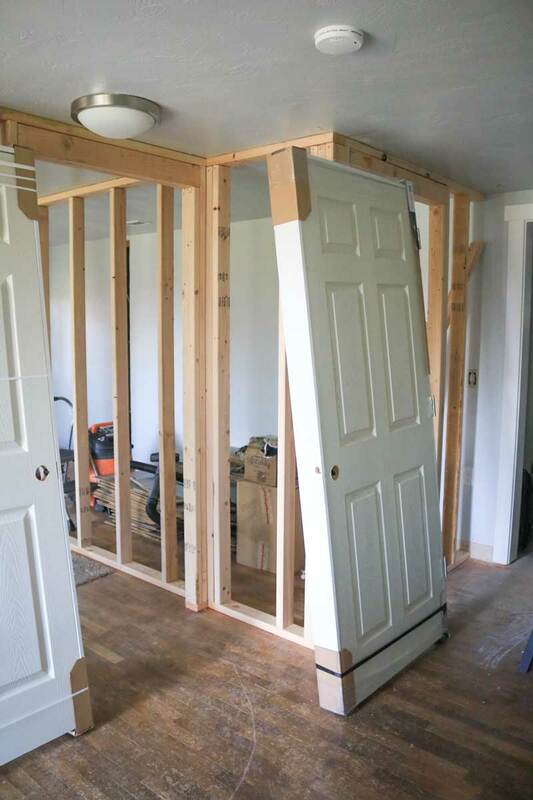 Then drywall went up, doors were hung… (bathroom is the new door on the right). And the bathroom sat and basically served as a storage closet for the last few months. Oh my goodness….I can’t believe I’m showing you this picture. How embarrassing. Here’s where we are at today… It ain’t any prettier. Even the subfloor is gone as we rough in the plumbing for the bathtub. Can you see it yet…? No? Well I don’t blame you. Even I am having a hard time seeing how this mess is going to turn into something beautiful over the next few weeks. We’ve got a LONG ways to go. 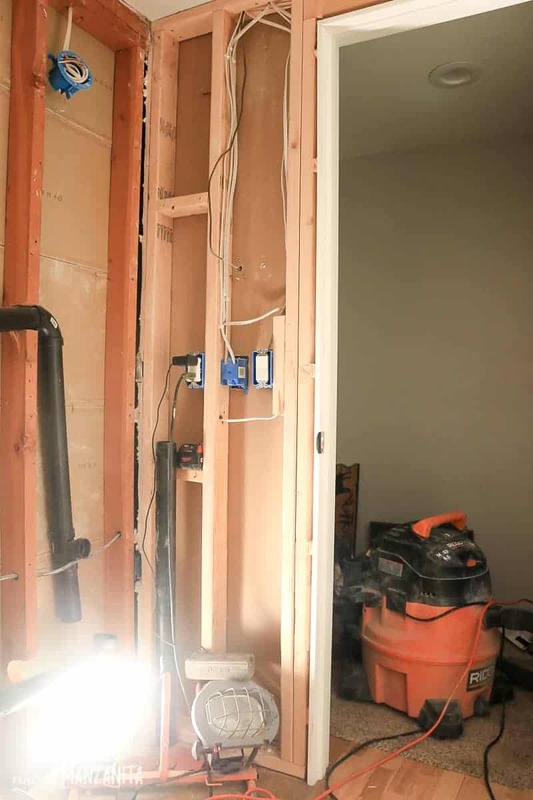 Right now our days are spent running into frustration after frustration (and back and forth to Home Depot) as we work on the bare bones of the bathroom, which is the not so fun part. But, you want know what the light is at the end of this renovation tunnel? Well for me, it is the pretty stuff! The design! The full design plan for this modern farmhouse bathroom renovation is comin’ atcha next week! Stay tuned friends and send help…in the form of coffee and babysitters if you love us. 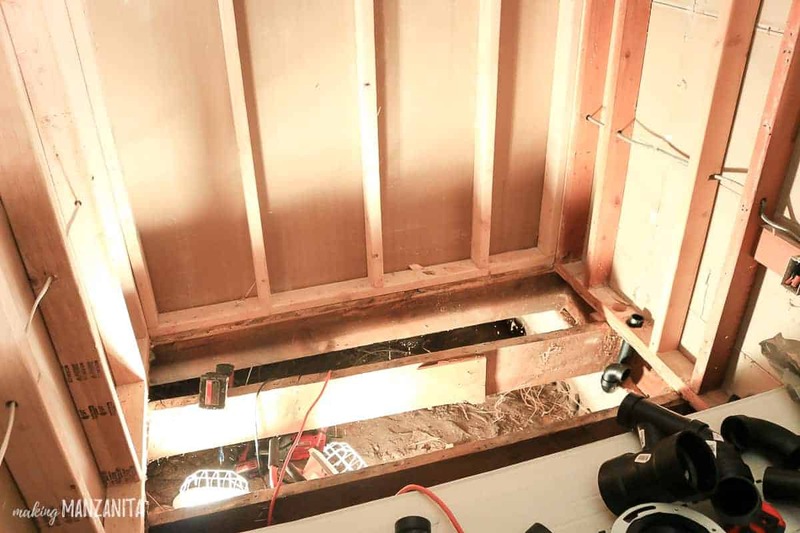 Did you enjoy these bathroom renovation pictures? Do you think we can do it? Wow! This is quite the undertaking to get done within 6 weeks, but I have faith in you! Excited to see it all come together! Holy Cow! What a fun project! You’ve got this!